We introduce ourselves as an eminent manufacturer, supplier, exporter trader, importer of Pneumatic Lithotripter Machine. Our lithotripter machines are designed by our professionals using advanced technology & best quality material as per the norms of a market. These lithotripter machines are used through rigid or semi-rigid endoscope incorporating a straight working channel. The offered lithotripter machines are known among customers for their long life. 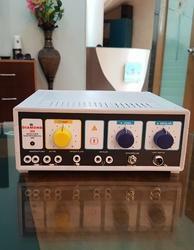 Dimension 4.5" x 11" x 10.5"
To meet the diversified requirements of our prestigious clients, we are offering an assorted range of 300 W Electrosurgical Unit. This electrosurgical unit is designed with top grade material and advanced technology by the competent workforce in accordance with certified industrial norms. The electrosurgical unit offered by us has separate cutting & coagulation controls with separate indicators & different audio tones. An offered electrosurgical unit is examined at our end before delivery. Dimension 4" x 12" x 11"
Backed by a team of experienced professionals, we are offering Electrosurgical Unit Digital. 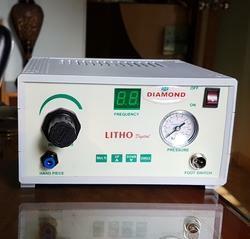 Our offered cautery machine is designed using high grade material and leading technology in sync with the standards of market. 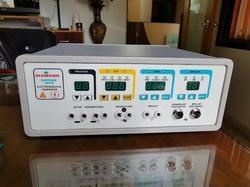 We also provide this cautery machine in numerous specifications as per the needs of our customers. As well, this cautery is used for a rare medical practice of burning a part of the body.